Dave and the Gang finished at 12:46 today with 12 dogs! Dave enjoyed a Budweiser while the team wolfed down a full meal in front of a cheering crowd. The Gang is zonked out in the backyard of the Kitchen Family; Dave’s unconcious in one of their bedrooms. I took a few pictures and will post them soon. The mercury continued to climb as we headed down the Klondike Highway to McCabe Creek Dog Drop, and Carmacks, Yukon. I enjoyed a nice sleep-in at the Pelly Checkpoint and then drove a few extra miles looking for the McCabe Creek Dog Drop. Coming from Dawson, there’s no sign marking the creek the homestead sits on – the caravan I was part of (4 trucks, 5 sets of eyes) missed on the first attempt. A few miles out of Carmacks, the former Italian Air Force pilot with a crazy fire in his eyes (handler for a Beligian team) conceded and we all turned around. Anyhow, the McCabe Creek Dog Drop is stationed on the homestead of the Kruse family. Their family has been housing the dog drop for the past twenty years or so. After a fire destroyed their main house over the spring/summer, they scrambled to rebuild and be ready for the 2010 quest. The Gang left no members behind at McCabe – Dave passed through in the heat of the day and rested 10 miles away. I met Dave at Carmacks yesterday evening at 7:45pm, rolling in with a rested team. I hung out with Dan and Zek in lead, as Dave packed his sled and strapped on a half-bale of straw. Again, Dave decided to camp outside of the checkpoint. He did, however, hang around long enough for the Carmacks volunteers cook him up two cheeseburgers to go. The vet team found no issues with the Gang during a brief exam and Dave skipped out of town minutes behind of one Belgian team and minutes in front of another. Once Dave was on his way, I took a couple hours to relax in a fine Canadian pub with a few other handlers and race personnel. Figure skating, a couple beers, and moose-burritos paved the way for a great night’s sleep. 177 miles to go! The Gang rolled into town under a momentary display of Northern Lights and enjoyed the hospitality of the checkpoint for no longer than 7 minutes. As the green aurora flared, Dave rustled through a drop bag, had his gear checked, ditched his heavy parka, switched leaders, and started down the trail again. Dave had his game face on and was brief with his words – three resting teams and the cooler night temperature urged him on to McCabe, another 30 miles down the trail. I expect Dave to take a rest at McCabe, an official dog drop – hopefully, I’ll pass on through that stop without adding another passenger to the dog truck. After that, it’s approximately 40 miles to Carmacks and 177 miles to the finish line. Keep in mind, there’s a mandatory 8 hour layover at the last checkpoint, Braeburn, a fine spot for the team to charge up for the final 100 mile push to Whitehorse. Looks like the Gang is in the running for 11th place, maybe 10. At the moment, Dave’s got a slight lead on Sam, Dries, and Kelley but will lose some of that ground depending on how long or if he rests at McCabe. On a another note, the Aurora Borealis must have fired up one of the resting Belgian teams as a 3 on 1 confrontation ended with a misbreeding under the starry green sky. When it rains it pours. For those of you following Dave on with the GPS Tracker, you might have discovered that there is sometimes a delay between transmissions. If the delay is several hours, that usually means the device has not been reset and the Gang is further down the trail than the GPS map shows. Since Dave left Dawson, the team has covered approximately 170 miles, checking in at the Scroggie Creek Dog Drop and resting a few hours at the Stepping Stone Hospitality Stop. Dave and the Gang left Stepping Stone at 22:30 tonight (10:30pm) and should be arriving at Pelly around 2:30am on the 15th. The distance is about 32 miles. It seems like he’s sticking to his original plan – a good call given the warm daytime temperatures (27 at Pelly this afternoon, 10 right now)) – and will probably blow through Pelly and cover some ground in the cooler morning temperatures. 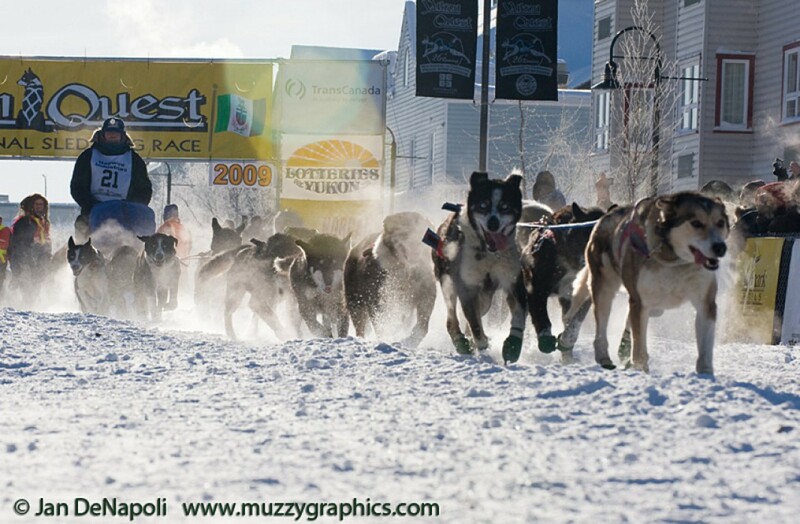 Since leaving Dawson, the Dalton Gang is still 12 dogs and 1 musher strong! I’m going to be outside to greet Dave and the Team when they arrive, but for now Pelly’s community center floor is calling to me. There are several teams within a couple of hours of Dave and the Gang. While Dave’s not pushing his team too hard, it was obvious in Dawson that he’s entertaining his competitive side, circling the teams that were within “striking distance” and possibly planning to move up a few places on the board. Dave’s 36 hour layover began at 18:14 on February 11 after a rather uncomfortable 306 mile journey from Circle. Dave feasted on some moose stew at the Eagle Checkpoint and soon experienced symptoms of food poisoning and extended his rest between Eagle and Dawson by a few hours. Dave and the Gang rested at 40 mile (a cabin 40 miles from Dawson) until the symptoms passed. The team was in good spirits but ready for their extended rest. Altair, the Gang’s 65 pound wheel dog, arrived in the sled bag due to wrist injury. Prior to Dave’s arrival, I prepared a shelter across the Yukon River from Dawson with plenty of straw. I was also sure to have a hot meal ready for the team. In order to minimize distractions during the layover, Dave called for the vet check right after arriving. Aside from Altair injury, other Gang members required extra care for their feet and wrists. While Dave rested, I continued the Gang’s 8 hour feed cycle and provided treatment at the same intervals. Feet were massaged with special ointments, wrist wraps applied to keep joints warm and reduce inflammation, and shoulder massaged. The Gang were quite comfortable in their shelter, lounging on two bales of straw in fleece dog coats, covered in blankets (weighted in the corners to keep the blankets in place). The Royal Canadian Mounted Police allowed mushers to thaw their sleds and gear out in a warm garage. Dave enjoyed several soaks in our host’s hot tub and dried his Arctic gear around her wood stove. Our host Shirley has been putting up with Dave for his 36 hour layover for almost 15 years and she’s quite accommodating. Check out her fabric arts and craft gallery in you’re ever in Dawson City at her home, Sign of the Raven. Her work is intricate and beautiful. Dave departed this morning with 12 dogs. Altair has been layed off for the rest of the race and will join Rio and I in the dog truck as we head back to Whitehorse over the next 4-5 days. The other dogs with minor strains and injuries benefited from the care and rest they received, and continued on down the trail. Dave was bright and chipper this morning, free of illness, and ready to take on the next 201 miles to Pelly Crossing. Before Pelly Crossing, Dave will stop at Sroggie Creek, 102 miles, for a 4-6 hour rest, and then on to Stepping Stone Hospitality Stop, and on to Pelly. I plan on catching some more solid rest here in Dawson, wander around town a bit in the morning, and then hit the road again in the afternoon. In the absence of contact from the gang, here’s a link to the live tracking of the mushers on the trail. It is quite active now that we are getting close to the end of the race. Dave and the gang is into Scroggie Creek with 12 dogs. Dave and the gang of 14 has checked into Dawson City in 14th place. at 6:15 Thursday evening. No journal entries to post. I assume they are busy. The gang can leave the checkpoint Friday 07:17 at the earliest. Remember, the team is pretty young with lots of new dogs this year. Dave said he was going to take it easy.